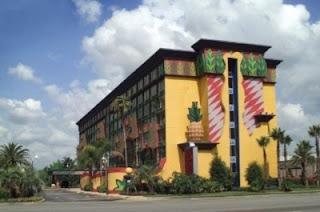 I've been living in a pineapple for the last 24 hours. This picture tells it all. It looks like a pineapple!! We got here yesterday and discovered that we had been "bumped" to another hotel. The pineapple. It was 8 or 9 miles away and it takes the directional senses of a sharpa to get there. The people were very nice at the pineapple. The locks to the doors were not. After 4 key changes we finally got one that kinda worked if you held your tongue right and if the moon was in the same orbital eclipse of Mars. The rooms were kinda clean. I'm sure at one time in their life they were. To be honest I was having a hard time getting past the 37 coats of paint on the walls. Then the internet service was going to cost me $10 a day. I don't need to blog that bad. By the way, International Resort and Spa is the one who "bumped" me. I have been delivered! Betty went on the hunt this morning and found an Extended Stay Hotel just down the street. Ahhhhh! REVIVAL UPDATE: We have been talking with lots of pastors here that have been attending the revival in Lakeland. This stuff is spreading like wildfire! I can not even begin to describe to you how bad "Hotel Hades" was. Even worse was how mad everyone was that had gotten bumped to there. We were expecting to stay at this luxurious resort, & got a cheap, dirty, Las Vegas hotel, clear across town. The hotel situation overshadowed the Council & was a part of every conversation at District Council. Even those who were given a room at the resort were all affected in some way. The resort had originally blamed the District Leadership for their lack of rooms, saying they authorized the move. Russ being a Presbyter & part of the leadership of the District knew this was not true & demanded to see the manager. He caught them in their lie & they quickly changed their story with everyone else who was bumped. God really blessed us! After dropping Russ off at the resort on Tuesday morning, Anneka & I set out to find a new hotel. As I was leaving, a good friend of our church, Gordon Matheny & his wife Florence, stopped us. He said he was staying at a new hotel right across the street from the resort, the Extended Stay. I know from previous experience, that some of the Extended Stay's are in bad shape, so I tried 2 other hotels first. I kept hearing Gordon's words of encouragement to go to the Extended Stay. Finally, Anneka & I walked over there, & asked to see a room. Much to our surprise, it was beautiful. The hotel was only a few months old. In our room was a queen size bed, a couch that pulled out into a second bed, a coffee table with magazines, a recliner, desk & chairs, a huge closet, a huge bathroom, a microwave, stove & oven, fridge, & cabinets completely stocked with clean dishes. They even provided the dish washing soap. The best part, it was $30 a night cheaper than what we were being charged at the resort across the street. Will we stay at the Extended Stay again!! Plan on it!! God is SOOOO Good! When we got home, much to our surprise, "Hotel Hades" had refunded our account for the horrible night we had to stay there.